Diane F. asks: Who started the tradition of girls jumping out of cakes? Almost everyone has seen depicted the bizarre bachelor party tradition of a scantily-clad woman jumping out of a giant cake. It turns up most often in decades-old films, TV shows, and comics, but it still persists today at lavish Vegas shindigs—though the cakes are now usually made of flimsy cardboard. Younger folks may have first encountered the ritual via The Sims: House Party, in which the player could buy a huge cake, then choose a command to hire an entertainer. If you’re thinking it’s a tradition that dates back to the swanky cocktail-fueled, pre-feminist Mad Men era, you’re only partly correct- humans have been putting odd things in their food for entertainment purposes for centuries. Beyond cooked animals stuffed inside other animals, Petronius wrote of dishes staged to make the animals appear as if they were still alive: fish arranged as if they were literally swimming in a sea of sauce, and a rabbit with a fowl’s wings attached, posed to look like the mythical Pegasus. Medieval royals continued the hosting of banquets so elaborate as to be almost grotesque, and they, too, had a penchant for staging tableaux that made cooked animals appear to be in action. Peacocks, for example, were seasoned and roasted, then arranged and decked out in their original plumage. Grilled roosters were dressed in miniature armor constructed of paper, and perched atop a suckling pig, complete with jousting sword, as if ready to do battle. Alcohol was set alight to create a fire-breathing effect from the mouths of unlikely creatures, such as swans or fish. The stereotypical apple that is so often thrust in the mouth of a roasted pig hails from this era—seemingly an attempt to suggest activity, as if the animal were still living and casually munching a bit of fruit. …In the empty space that remains around the small pie, put some live birds, as many as it will hold; and the birds should be placed in it just before it is to be served; and when it is served before those seated at the banquet, you remove the cover above, and the little birds will fly away. This is done to entertain and amuse your company. And in order that they do not remain disappointed by this, cut the small pie up and serve. The trend continued into the 1600s, with famous families like the de Medicis surprising guests with live birds in pastry crust for a wedding party. Robert May, author of a 1660 British cookbook, describes how the birds would tend to flap about and seek the light, extinguishing all the candles, and how the hopping frogs cause the ladies to shriek, creating “a diverting Hurley-Burley amongst the Guests in the Dark!” The phenomenon ultimately may have inspired the nursery rhyme “Sing a Song of Sixpence,” in which four-and-twenty blackbirds are presented in a dish to the king. Today the practice lives on, in a way, in the form of “pie birds”—small, ceramic birds placed in pies to allow steam to escape. Even though the live-bird pie trend ultimately fizzled out, some royals hardly missed it, as they had already taken it to the next level. At a banquet hosted by famed French engineer Philippe Le Bon, among the many ostentatious entremets was an enormous meat pie containing a reported twenty-eight musicians, who played as the giant crust was opened. In 1626, the Duke and Duchess of Buckingham presented Charles I with a pie from which emerged a dwarf. Sir Jeffrey Hudson was given as a gift while he was still quite alive, though internet stories continue to perpetuate the rumor that he met his demise by being baked in a pie. By the 1800s, the humans buried in pastry seemed to be limited to attractive women, as some of the most decadent parties of the era were those given by wealthy men to entertain other important males while their wives stayed at home. 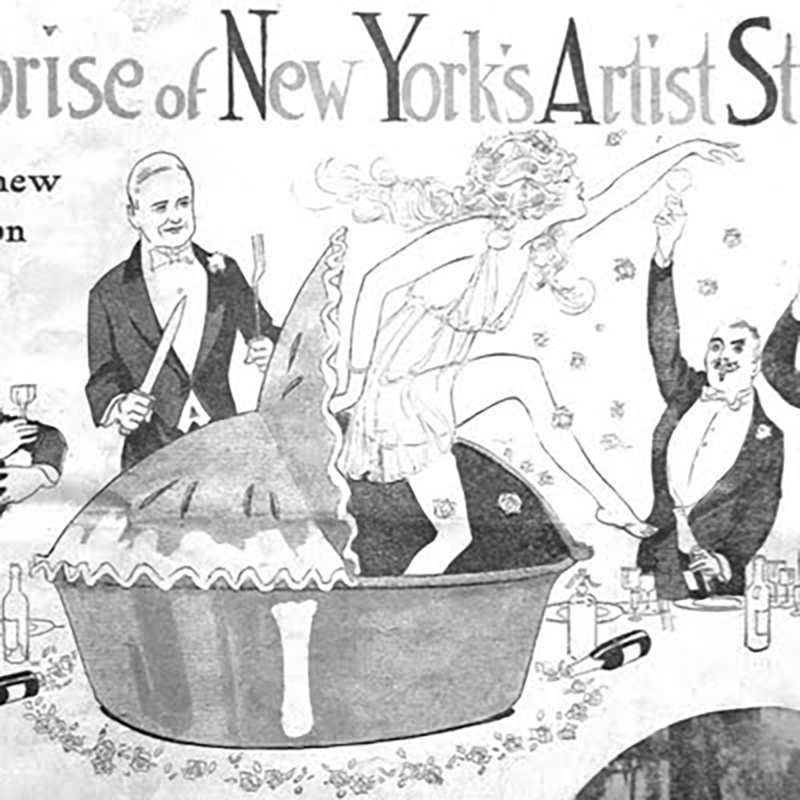 One of those hosts was Stanford White, a rich architect who threw a debauched dinner party in New York City in 1895 for a gathering of other distinguished men (including illustrator Charles Dana Gibson and inventor Nikola Tesla). Just a few years later, “The Pie Girl Dinner,” as it came to be known, was front-page news after White was murdered by the enraged husband of Evelyn Nesbit, the latter of which came to be known as “The Girl in the Red Velvet Swing.” White had reportedly raped the teenage Nesbit a few years before while she was unconscious in his home after drinking champagne with him. She then became White’s mistress for about a year before breaking the relationship off and later marrying the enormously wealthy Harry Thaw. While this may not have been the first time a wealthy man had thought to have a girl jump out of some large food item, it certainly popularized the practice. After reading about it in the news, it didn’t take long for regular folks to think that their parties would be better with a woman inside some sort of baked good. By the end of the 1970s, the popularity of women inside cakes faded as equal rights gained steam- with more and more women in the workplace, scantily clad women in cakes were less welcome at company functions and other such events, leaving only the occasional appearance at bachelor parties as the last vestige of this curious practice. Now and then you’ll spot spoof versions of the trope, such as James Franco and Seth Rogen popping out of a cake for Jimmy Fallon’s birthday. You can also still find scantily-clad female cake-poppers anywhere excess is still in full supply (think Vegas), though we’ve now swapped royals for minor celebrities, or those who want to live like them. Lavish handiwork is no longer needed; it’s as simple as hiring a stripper and purchasing a cheap cardboard cake-shaped structure. Like the ceramic pie birds that are only a symbol of the elaborate banquets of kings, the cardboard cakes are just remnants—the merest hint of the excess and decadence that inspired them. “Bachelor party cake costs about $2,000” Lubbock Avalanche-Journal, Aug 19, 1975. “Disturbing and bizarre”. Two words which spring to mind whenever I come across any of your inane drivel. Loved reading the article, especially the research behind it. Light, fascinating, and certainly food for the brain. Who would’ve thought the practice had such a colorful history?